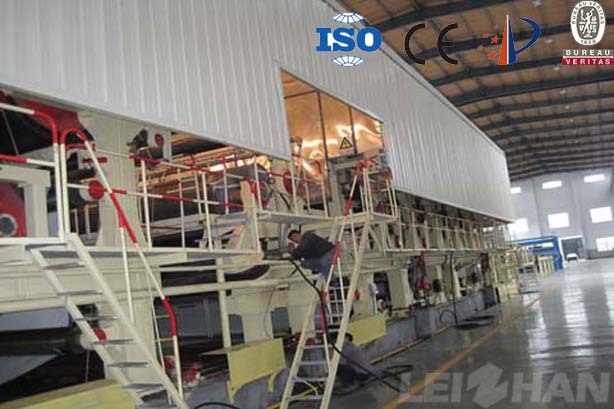 On the one hand, the paper sheet is cooled (down to 50-55° C.), on the other hand, the paper sheet temperature is low, and the water vapor in the dryer section is generated. Condensation on the surface of the cold cylinder, resulting in the formation of a water film. The cooling and regurgitation of the paper sheet also helps to eliminate static electricity from the paper. In general, a cold cylinder may be provided at the position of the last two cylinders of the drying section to increase the moisture content of the paper web surface and improve the smoothness of the net surface after calendering. The cold cylinder is cooled by cold water. Cold water passes through a 35 to 40 mm diameter tube and enters the cylinder axially, spraying the water uniformly on the cylinder wall. The warm water after absorbing heat can be drained by a siphon on a high speed paper machine. In order to avoid rust on the surface of the iron cylinder, a cylinder sleeve can be added to the cylinder surface or a layer of 2.0-2.5 mm stainless steel can be plated with the sprayed metal.